Great art is meant to be experienced. It is not enough to see a picture of a painting by Delacroix or Jacques-Louis David in an art history book. You must tramp across the wide corridors of the Louvre and encounter them in all the massive, unbelievable glory and beauty; anything else is only a poor substitute. This sort of artistic experience is a great blessing, and it explains why so many people continue to visit the great museums of the world. Unfortunately, accessing work like this is difficult when you don’t live near it and must travel to see and experience it. There is only one Venus de Milo, only one Virgin of the Rocks. Great art it seems makes great demands on us not just of understanding and taste but also of time and expense to see and love it correctly. But that is not the case of one form of art. There are so many times when Jackson surprises me. Of course, sometimes these surprises are not welcome ones. Honestly, no matter what place we inhabit, we are surprised more often by the disappointments and shortcomings of our location than by the unique beauty and gifts it provides for us. This can be especially true when you have spent the vast majority or your life in one place, like I have in Jackson, Tennessee. I know that I take for granted much of what Jackson offers merely because I am used to it. One of those forgotten surprises is the Jackson Symphony. Classical music is one of the great art forms. Just like visual or literary art, it can transcend time and space to give listeners an entrancing sense of beauty, emotion, and truth. It is demanding for those who wish to understand it and accessible to those who wish to experience it. It has rules and patterns and categories. It has changed over the centuries, both in its popular forms and style. With masters from Palestrina, Mozart, and Beethoven to Stravinsky, Debussy, and Wagner, classical music crosses borders and nationalities to carry the beliefs, dreams, and ideas of past ages to any who are willing to listen. What makes classical music different from other high art forms is that it is not limited by location. I can only truly experience Botticelli’s The Birth of Venus at the Uffizi in Florence, or the Pietà of Michelangelo in St. Peter’s Basilica, but there is nothing very great that prevents my experiencing Mozart’s Marriage of Figaro or Sibelius’s Violin Concerto in D minor right here in Jackson in the exact way the masters intended their works to be experienced. It is not necessary for you to travel to Vienna, Berlin, Paris, or St. Petersburg to experience the great works of music that were created there; you only have to travel across town or into the next county, provided that your area has a symphony. A professional symphony is an even greater gift, the skills and abilities of the musicians and conductors better able to faithfully and beautifully produce the best music possible. It is truly amazing that for nearly sixty years Jackson has had a symphony that makes these and many other great works of the past available to what is a relatively small community in rural West Tennessee. Our city is blessed by the work and love of many people who over the last six decades have poured their time and resources into making a professional symphony possible. What began as a small volunteer orchestra in 1961, conceived and brought to life by a few leading citizens who were passionate about bringing classical music to Jackson, quickly turned into a professional orchestra led by James Petty, then Jordan Tang, and now Peter Shannon. It now employs over sixty-five area musicians performing thirteen concerts throughout the year with an annual budget of over $700,000. These concerts are not all that the symphony does for the community, however. Since 1998 the Symphony has sponsored and run a youth music program, which has now grown into three distinct youth symphony and orchestral groups, allowing young people to participate in the joy of performing ensemble works of classical music. In the last few years, the symphony has also launched an integrated music program with Jackson-Madison County General Hospital, which allows musicians to play for patients in the hospital every week. All of this work takes substantial funding, and like most symphonies throughout the country, the vast majority of that funding does not come from ticket sales, which only covers about thirty percent of the symphony’s annual costs. 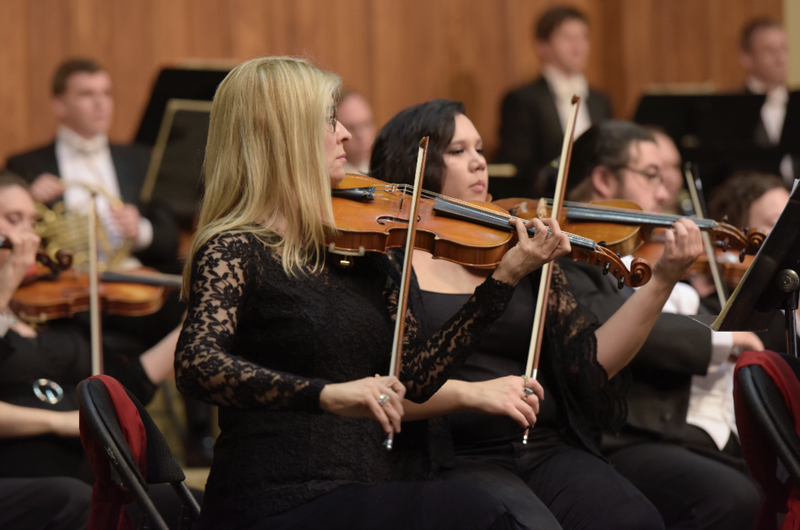 The rest comes from both private and corporate sponsors, as well as government grants, and this sort of continual investment is essential for the symphony to continue. Ours is in the top thirty-five percent of symphonies in the country in terms of its budget, and most cities Jackson’s size, and many much larger, have nothing close to its level of talent. It is important that we don’t take it for granted. Get out this year and enjoy a Jackson institution with deep roots that is doing great work in the community. Experience the best that the Western musical tradition has to offer without ever leaving town. The Jackson Symphony office is located at 207 East Lafayette Street and is open Monday through Friday from 9:00 A.M. to 5:00 P.M. To learn more, contact them at 731.427.6440 or visit their website.